Saudi Arabia and the US have signed 46 deals in these sectors, of which 13 are in the oil and gas sector and six each in the defence and technology sectors. As many as 750,000 jobs are expected to be created in Saudi Arabia and the United States following the signing of landmark agreements worth a total of more than $400 billion in 10 key sectors during the ongoing visit of Crown Prince Muhammad Bin Salman, deputy premier and minister of defence. These vital sectors including defence and oil are identified for attracting investments as part of a vibrant economic partnership program in line with the Kingdom’s Vision 2030. The Kingdom and US have signed 46 deals in these sectors, of which 13 are in the oil and gas sector and six each in the defence and technology sectors. There are seven memoranda of understanding in the health sector, four in manufacturing, three each in mining and petrochemicals, two in investment, and one each in the aviation and energy sectors. More than one-fourth of these investments go to the defence sector with an investment of $128 billion. The signing of the deals showed the Kingdom’s keenness to build local capabilities in the military industries. 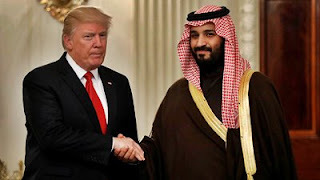 Five MoUs worth $18.5 billion were signed by Saudi Military Industries Corporation and Aviation Information Technology Company (SAVIT) with a number of leading US companies including Boeing, Lockheed Martin, Raytheon, and General Dynamics for developing military hardware systems. The total value of deals signed in the petrochemical sector reached $72 billion while the deals in the oil and gas sector amounted to a total of $54 billion. In the investment sector, the total investment would account for $150 billion whereas the MoU in the aviation sector is for buying 16 wide-body aircraft with values ranging between $2 billion and $5 billion. There will be $5 billion investments in the technology sector, $6 billion in mining, $3 billion in health, $12 billion in energy, and $400 million in manufacturing. Meanwhile, Crown Prince Muhammad arrived in New York where he is expected to meet several prominent businessmen and Wall Street bankers.The five-day stay of the Crown Prince in New York will be filled with meetings both political and economic in nature. The Crown Prince will participate in the Saudi-US CEO Forum, the Saudi Embassy in Washington said.The forum will be attended by prominent figures, such as JPMorgan Chase CEO Jamie Dimon, Co-Founder of Kohlberg Kravis Roberts & Co Henry Kravis, and Chief Executive Officer of NASDAQ Adena Friedman. Economic relations between Saudi Arabia and the United States are witnessing a new phase after the signing of several agreements and memorandums of understanding worth hundreds of billions of dollars in various sectors, including the technology sector. Agreements signed between Saudi Arabia and the US in the technology sector included the signing of a MoU between the Saudi government and Microsoft to contribute to the digital transformation of Saudi Arabia through the transfer of knowledge and acquisition of systems related to artificial intelligence. Four other MoUs were also signed between a number of Saudi companies, including Saudi Aramco, Saudi Electricity Company and Safnat, with a number of US companies to build the advanced data systems and optimize the utilization of 4G technologies in the areas of their work to improve business efficiency and development. Agreements signed by Saudi Aramco included one with Honeywell to make use of the company›s services in the Fourth Industrial Revolution to create 400 jobs by 2020 and an agreement with GE to support the digital conversion of Aramco operations in the Fourth Industrial Revolution worth $4 billion and expected to create 750 jobs by 2020. Saudi Arabian Mining Company Maaden signed an agreement with Alcoa to expand its mining capacity in Ras Al Khair Industrial City by investing $500 million in a deal expected to create 500 jobs by 2020. Maaden and Mosaic also signed a feasibility study for Phosphate 3 project worth $45 billion and expected to create nearly 1,000 jobs by 2020.